Dave: Over the years it consisted of whatever I was asked to do, whether to count herring and eels, paint a donation box, taking photos of the Trust’s conservation land, and other odd jobs as well as writing articles for the Sherkin Island Marine Station News publication and the Sherkin Island Comment both based in Ireland. Beth: I’ve counted eels and herring as well as discovered vernal pools, analyzed data for HCT outreach projects, and helped on many office projects. 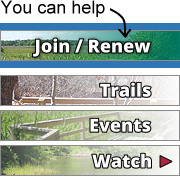 Dave: I began my involvement with the Trust in the late 1990s while I served on the Town of Harwich Conservation Commission, reviewing land parcels that were proposed for purchase and protection, dedicating the bench on Bell’s Neck Road overlooking the Herring River, and supporting the Trust’s programs by speaking at town meetings as a citizen. Beth: I’ve been involved at least 6 years, maybe more. Dave: The most memorable moment was the time my wife, Beth, received the “Volunteer of the Year Award” for doing so much for the Trust, both in the office and in the field. It’s what gave me the impetus to continue to volunteer along with her. Beth: I like the idea of being a caretaker of the earth. The most memorable moment was July 5th in 2009 watching Dave dance as an unidentified, irritable, and understandably surprised snake struck at his pant leg three times before leaping into the herring raceway at Hinckley’s Pond. Other memorable moments include any vernal pool expedition and any repetitive and/or convoluted office chore that has no end in sight. 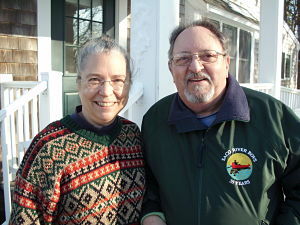 Dave: Since 1957, I annually traveled to the Cape due to a love of surf fishing. When my opportunity to retire arrived, I was torn between moving to the coast of Maine or to Cape Cod. Both offered the great beauty of small town New England and gorgeous geography. However, all things being equal, the winters on the Cape are milder and friendlier. I chose Harwich, to be honest, because I found a home in 1995 that I could afford, given that I qualified for a limited mortgage. It’s been one of the best decisions of my life. Beth: I came because Dave was here. Dave: After moving to Harwich, I spent five years on the town’s Conservation Commission, four as Chairman. I also served on the ad hoc committee to find a site for affordable elderly housing, which ultimately led to Pine Oaks III on Oak Street. Currently, I’m not involved with other activities except for the Guild of Harwich Artists. After almost ten years as the Guild’s Public Relations coordinator, my eyesight deteriorated to the point where I no longer could continue in that position. Beth: It’s not officially labeled as volunteering; but I just help whoever needs whatever within our circle of friends, acquaintances and family.